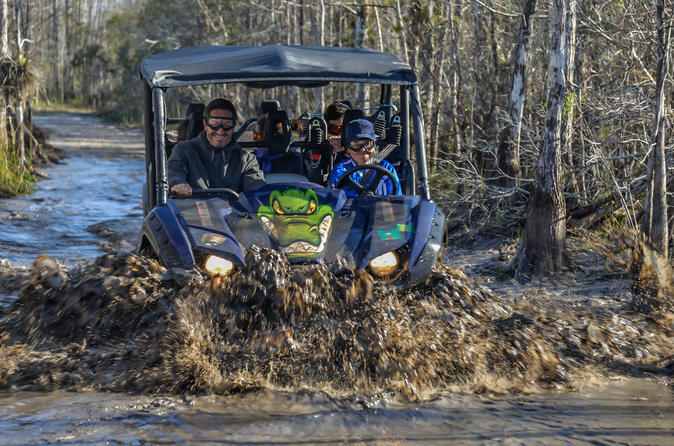 Enjoy the first and only UTV Tour of Big Cypress National Preserve at Everglades National Park! Your adventure begins with pickup from your hotel in Miami at your desired time. From there, you will be driven to Big Cypress National Preserve, about an hour drive. One you arrive, you will be ready to get on you 4x4 vehicle, once you finish the safety briefing given by your guide. You will then be set free to discover a magical place and adventure through the core of Big Cypress and the Everglades while listening to your favorite music. This tour lasts about 3 hour and snacks and bottled water are included. You will be driven back to your hotel in Miami, concluding your adventure. Your adventure begins with a pickup at your hotel in Miami, at your desired time. Upon entering Big Cypress Trails, you will be welcomed by the flora and wetlands that make this place remarkable. You will embrace nature to the fullest, with the cleanest air and scenic trails that will transport you away! The values and efforts of both scientists and conservationists alike are helping to preserve the Big Cypress to make sure this tour is both fun and educational year round. With these 2017 UTVs you are guaranteed direct contact with everything this park has to offer! You will see deer, snakes, bears, orchids, trees, maybe even a gator or two, all within reach! Your excellent guides will give you some commentary along the way while you enjoy beverages and snacks for the next 3 hours.